Alex Johnson has been competing at the senior national level since the 2009-2010 season. His highest placement was sixth in both 2016 and 2017 and he finished eighth in 2018. Now at the age of 28, Johnson will make his senior ISU Grand Prix debut this November, having been invited to NHK Trophy in Hiroshima, Japan. 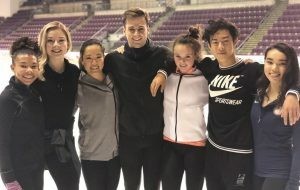 He recently talked to Figure Skaters Online — before and after Champs Camp (August 18-23, 2018 in Colorado Springs, Colorado) — about how he found out about his first Grand Prix assignment, his new programs, and his goals for the 2018-2019 season. Figure Skaters Online (FSO): You won your second international medal at 2017 Nebelhorn Trophy. Can you tell us what that was like and what did that mean to you? Alex Johnson (AJ): Getting back on an international podium was incredible. Nebelhorn was during the summer internship recruiting season, so I had a lot going on. Not only was I trying to skate the best that I possibly could, but I was trying to stay caught up with my studies and secure an internship for the summer. Ending up 2nd and having one of the best short programs of my life was something I’m very proud of. Yes, the end result was great, but what I was most proud of was my ability to juggle everything going on in my life and still perform at a high level. FSO: Where were you when you got the news that you received your first Grand Prix assignment? What was your initial reaction to the news? Has it sunk in yet that you’ll be competing in Japan in the fall? Alex (center) with Starr Andrews, Gracie Gold, Angela Wang, Mariah Bell, Nathan Chen and Karen Chen at Champs Camp. AJ: I was actually sitting at my desk at work and Angela Wang texted me. I was busy working on a project and wasn’t going to check my phone (sorry Angela if you’re reading this), but when it kept buzzing, I was curious as to what was going on. Angela’s text said “ALEX!!! NHK!!! !” followed by another one that said “You got NHK, we’re going together.” I couldn’t believe it! It was a very exciting moment however, and I definitely had trouble focusing the rest of the day. I cannot wait for this opportunity! FSO:What are you most looking forward to about competing in Japan? Will this be your first time in Japan? AJ: This will be my second time in Japan. I went a few years ago to train with Mie Hamada and her camp in Osaka. I’ve worked with her off and on over the years as she had come to Colorado with her skaters many times. She had always told me how great it would be if I could come do NHK and now it’s finally coming true. 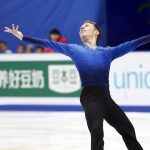 I’m looking forward to skating in front of Japanese fans, it seems to me that they are the best in the world! 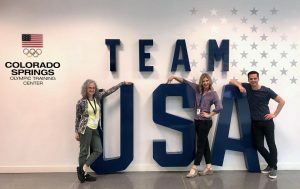 FSO: What is your short program and who choreographed it? What is it like and how did you decide on that program? AJ: My short program is to “Song of the Stars” by Dead Can Dance. I actually choreographed it myself. Initially I didn’t want to, because I love working with other choreographers, but Page [Lipe, my coach] thought it would be a great challenge for me. It has a modern yet tribal feel to it. I’m excited to see what people think of it at Champs Camp. FSO: What is your free skate and who choreographed it? AJ: My free skate is to “The Golden Age”, “Iron”, and “Run Boy Run” by Woodkid. It was choreographed by Shae-Lynn Bourne who I absolutely adore. This program means a lot to me. Page actually came across both my short program and free program music this year. Usually it takes me a very long time to find pieces to skate to, but this year it was a very quick process. We had ideas of the genre of music / vibe we wanted to create and the music sort of fell right into our hands. Alex with his coaches, Page Lipe and Caryn Kadavy, at Champs Camp. FSO: What was it like to attend your first Champs Camp? What have you enjoyed most? What surprised you about the experience? Did you get some good feedback on your programs? AJ: I had a great time at Champs Camp. It was inspiring to be around such incredible athletes and was a wonderful jump start to the season. My favorite parts of camp were the off-ice dance classes and the media aspect. I did receive feedback on my programs, and will be making a few changes – but nothing major. I also have to say that camp was a lot more exhausting than I expected. Not only were we training and performing, but we had off-ice classes and various appointments throughout the entire camp. FSO: What are your goals for training this summer, on the technical side (jumps, new spins, etc.) as well as program component aspects? AJ: I want to enjoy the process – it’s as simple as that. FSO: What are some of your goals for this season? AJ: Once again, I want to soak in all of these experiences and enjoy the process. I would love to be on the U.S. Championships podium this year and feel that by performing to the best of my ability, I have the potential to be there. FSO: Any club competitions planned? AJ: I will be competing at Mid Atlantics in NYC [September 7-8, 2018]. FSO: Tell us about your summer internship. Where is it? What are you doing there? What has it been like so far? AJ: I interned at Lazard Middle Market as an Investment Banking Summer Analyst. I worked as a generalist in the Industrials and Business Services group. I was working on sell-side M&A deals. It was an incredible experience and I learned a lot. FSO: How is school going? Taking summer courses? How many classes do you have left? What is your major? AJ: I will be graduating in December of 2018 and have only 6 credits left. I will technically only be going part-time in the fall to finish up my classes, so it will be a great way to wind down my undergrad. experience. FSO:You moved back to Minnesota two years ago. What is it like to be home and training in Minnesota? AJ: I love Minnesota. While it seems a lot smaller of a city as an adult, it will always have a special place in my heart. I didn’t have much time this summer to go out on the lake or do anything other than work/skate, so I’m definitely going to try to soak up as much sun as possible in the last few weekends of summer. Being home is great. My sister had a baby back in November and it’s been nice to be around for that. While I still don’t see him much, I definitely have been able to participate in more family events than I did when I lived in CO. Training in MN is also quite a different experience. It’s much less intense than Colorado, which has been an interesting adjustment. Some days I absolutely love it, and other days it’s a bit more difficult because there aren’t the same amount of elite skaters around motivating you to get your work done. That being said, you have to adjust to your environment and make do with what you have. While some of the kids I skate with may be working on swizzles and single Axels, it’s still fun to have jump competitions with them. Don’t get me wrong, there are also some very talented skaters at my rink, it’s just much different than what I was used to in Colorado Springs. FSO:Any fun summer plans other than your internship and skating? AJ: Now that my internship is over, it’s time to tend to all the things I neglected this summer. I’ll be heading to Toronto to work with Shae over Labor Day weekend, classes start September 4th (which I’ll be gone for), I then head to NYC to compete at Middle Atlantics, I move into a new apartment on September 10th and then fly to Boston for Evening With Champions 4 days later. It’s going to be a jam-packed month, but I’m really looking forward to it.